The scenery at Hanging Rock might only be half finished but that's not going to stop me from having a little fun with Photoshop! Creating images like this helps me to envision the story behind a scene. 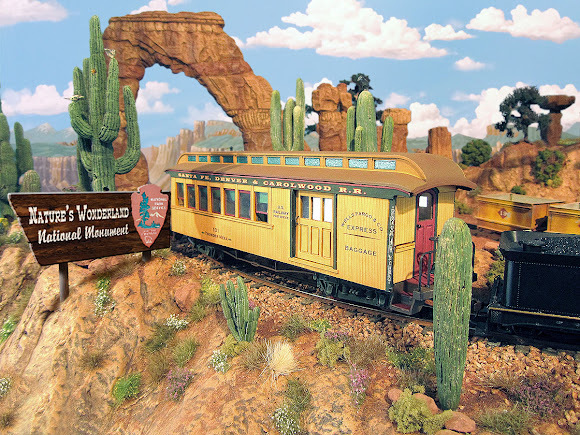 Ready or not, here comes an end of the month update from Thunder Mesa! 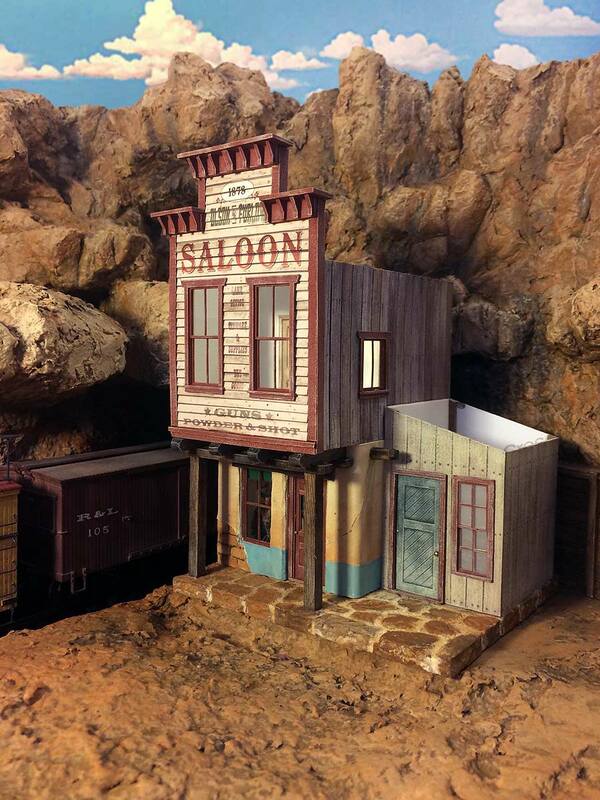 I haven't had much time for updates this month but scenery work has been progressing on the Hanging Rock section of the layout, and I'm nearly finished with the structure build for Olson & Furlow's Saloon. Even with several things half done, I wanted to share an update and video log on how things are coming along. 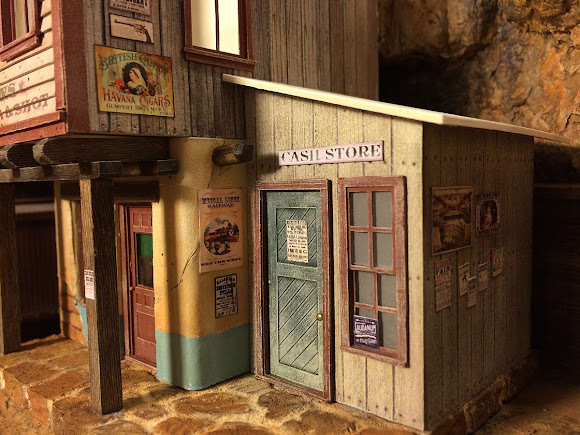 Rockwork and coloring has been completed in the little canyon nook where Olson & Furlow's will find its home. 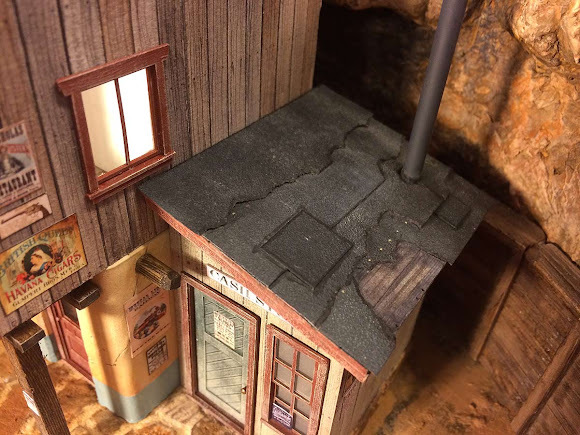 It still needs ground cover, vegetation and other details but here's a quick rundown on how the scene has come together so far. The canyon walls and rocky ledges of Hanging Rock were built up with layers of 1" thick polystyrene foam insulation - the pink stuff from your local home center. 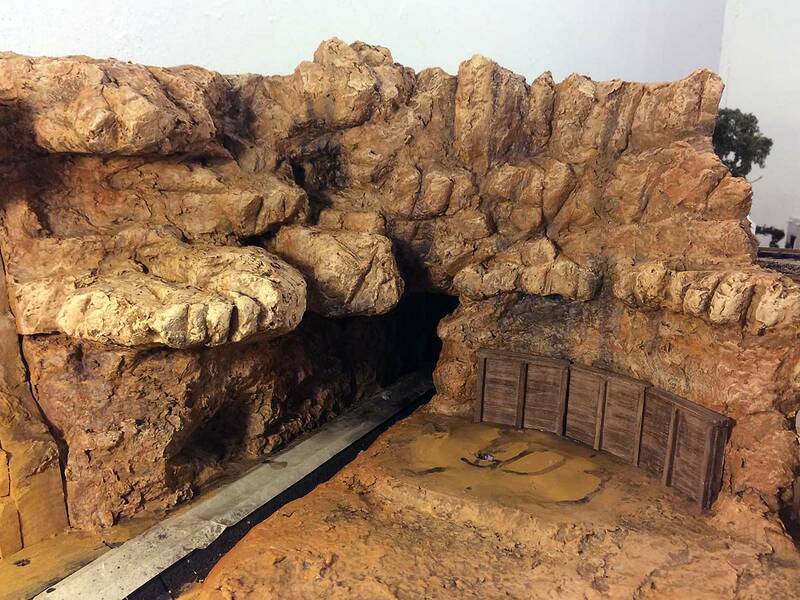 Here the foam has been painted with my scenery base color to better help envision the final scene. There's also a view of the original paper mock-up of Olson & Furlow's, a structure that has evolved a lot from this plan during construction. 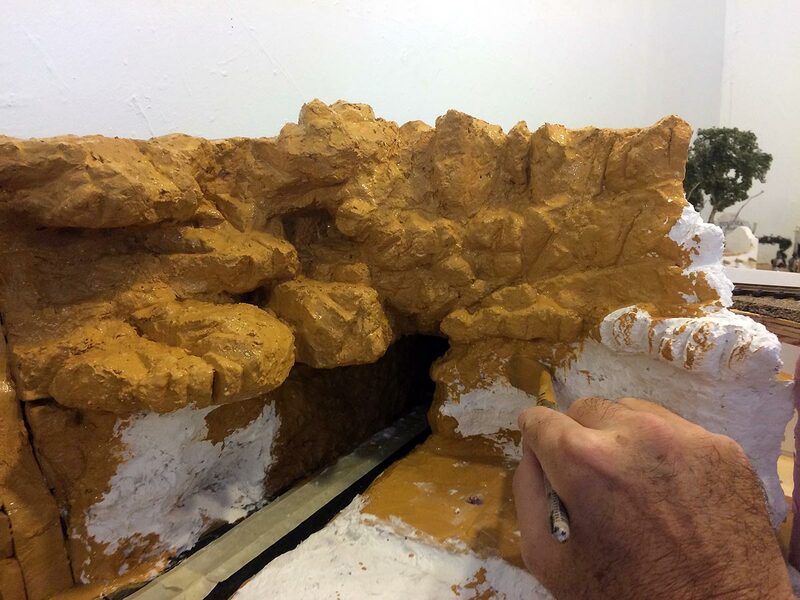 Once I was satisfied with the basic shapes, the foam was skinned with a layer of Sculptamold to further texture and define the rocky canyon walls. 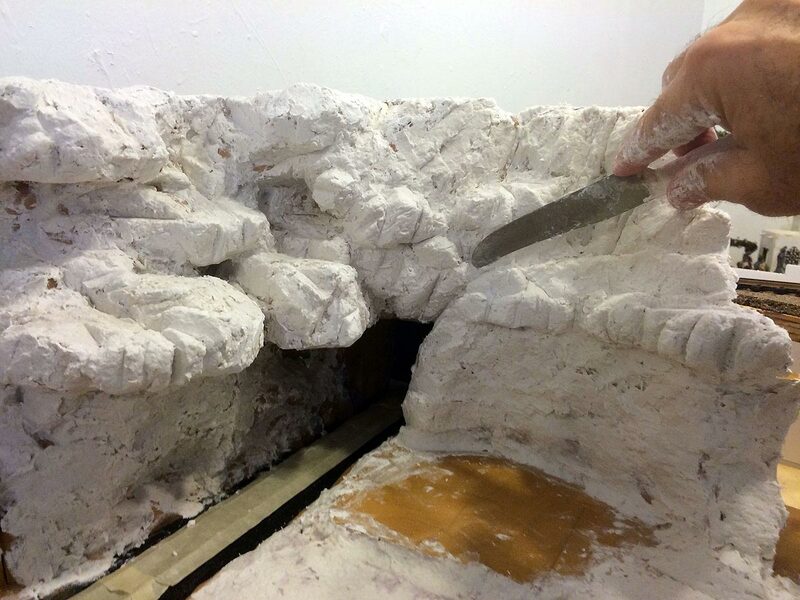 Sculptamold is a mixture of plaster and cellulose available from American Art Clay Co. at better stocked hobby and craft stores. After the Sculptamold dries it's time for a coat of my scenery base color: Glidden "French Mustard" flat interior latex paint. 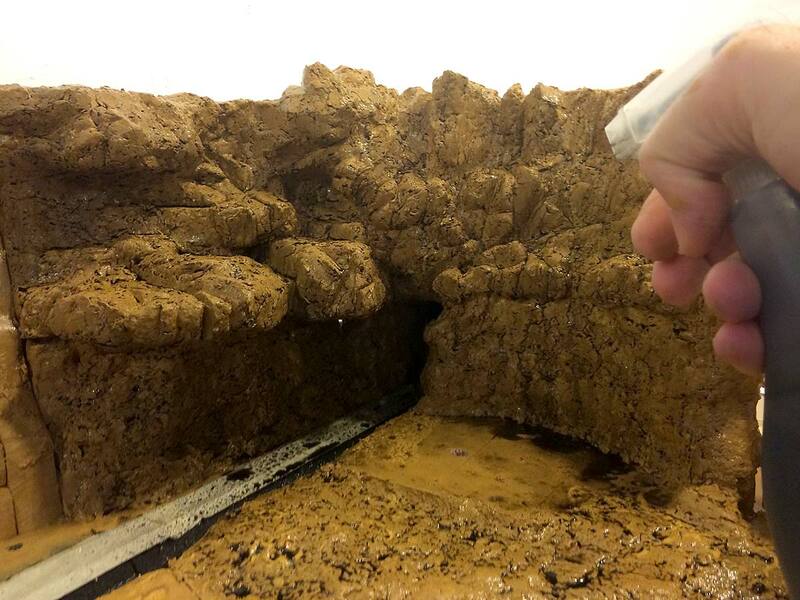 Then I darken the rocks with a spray of diluted black, letting it flow down into all of the cracks and crevices. The final paint job is completed using artists' acrylics. The main colors used are Raw Sienna and Unbleached Titanium, with just a little Burnt Sienna and Burnt Umber here and there for variety. The colors are lightly dry-brushed on right out of the tube, catching the rough texture of the rocks and letting the under-color and darkened shadows show through. The wooden retaining wall is a hydrocal casting from Woodland Scenics. The main structure in Hanging Rock is Olson & Furlow's Saloon and Store, an appropriately character filled establishment built as a tribute to two of may favorite model railroad authors of the past. I'll be writing much more about this scratch-built model for an upcoming column in Model Railroad Hobbyist Magazine so I don't want to give away too much here. Suffice to say that I wanted something with a lot of texture, charm and visual appeal to act as a focal point for the scene. To show a long and storied history, I chose to design the structure with a Victorian wooden upper story built atop an older adobe base. Both the wooden walls and the adobe are modeled with illustration board. The base of the structure is 1/4" thick MDF, carved with a Dremel tool to simulate flagstone. The colorful vintage signs and posters are a hint at the final super-detailing to come. The old tarpaper roof on the store section has seen better days. The tarpaper was modeled using strips of 220 grit sandpaper painted flat black. The nail heads are tiny dabs of gray acrylic paint. I'm so humbled and flattered by those who choose to follow my efforts here on this site and also on social media. 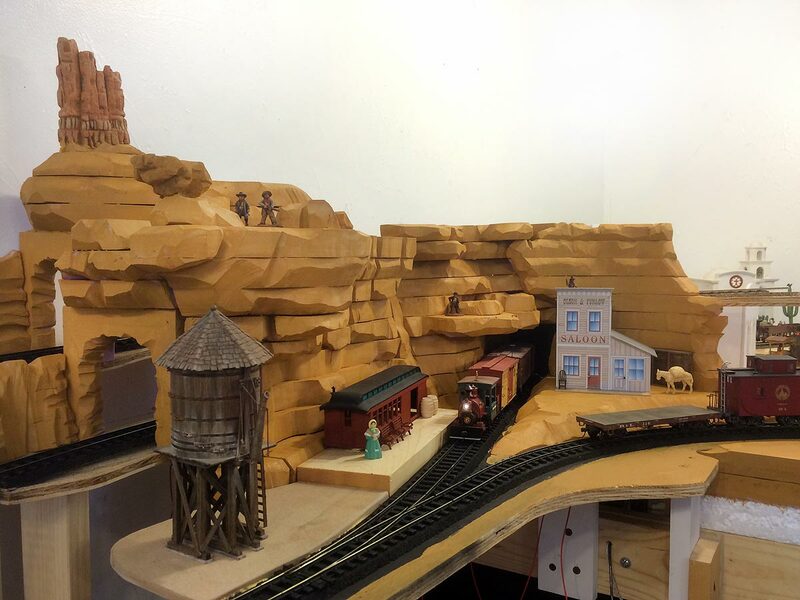 Thunder Mesa's Facebook page recently surpassed 500 likes and that's not bad for a quirky little hobby like this. If you like this site I hope you'll also come over and join the conversation on Facebook. 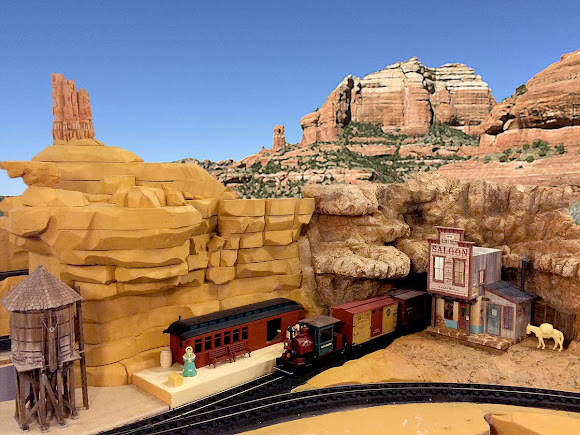 There's a lot of new stuff posted there first, mostly about this model railroad, but also interesting stuff about the larger worlds of railroading, model building, themed design and Disney. Thank you. That's all for this time, amigos. Thanks for checking in. Adios for now!